Apple is doubling down on its retail and cloud operations. The company says it will spend about $8 billion in capital expenditures in 2012, which is almost twice as much as the $3.4 billion it spent during fiscal year 2011, which ended Sept. 30. Apple (s aapl) doesn’t willingly telegraph its plans, but thanks to its annual filing with the Securities and Exchange Commission, we get a peek into where the company plans to invest its money next year. The increase was pointed out on Monday by Analyst Maynard Um of UBS in a research note. A chunk of that new investment will, no surprise, go toward its retail operations. The company will spend $900 million on its stores in 2012, up from $614 million this past year. Apple Stores have been growing rapidly, particularly outside the U.S., and especially in the greater China region. Apple opened 30 new stores in the most recent quarter alone, to bring the total to 357. CFO Peter Oppenheimer noted on Apple’s earnings call two weeks ago that the company would be opening 40 new stores in 2012, and “75 percent of those will be outside the U.S.” He also noted that Apple would be “replacing” some of the company’s higher-volume stores here in the U.S. The Company anticipates utilizing approximately $8.0 billion for capital expenditures during 2012, including approximately $900 million for retail store facilities and approximately $7.1 billion for product tooling and manufacturing process equipment, and corporate facilities and infrastructure, including information systems hardware, software and enhancements. Apple is building out a gigantic data center in North Carolina, and perhaps even a solar farm to power it — if reports are correct. That data center will support its cloud operations, and could increase the capacity and eventually lower costs for the maintenance of Apple’s iCloud service. Apple would never be accused of jumping on the cloud bandwagon early, but spending billions more underlines the fact that the company has much bigger plans for iCloud. 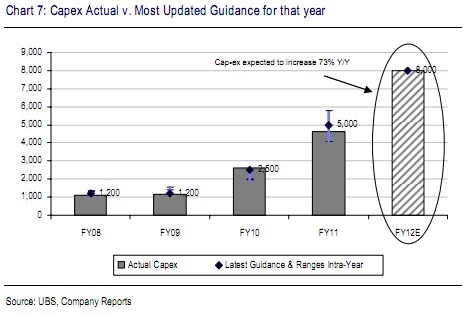 Why assume the growth in capex outside retail is iCloud? It cloud be tooling for a major new product category – thr rumored TV perhaps. Anyone else see a minor flaw in the math? Thanks, I also linked to it in my story.